From Marvel Studios Captain America: Civil War! 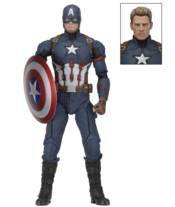 Based on his appearance in the blockbuster movie, Cap stands 18" tall and has two head sculpts, masked and unmasked, featuring the likeness of Chris Evans.The truly incredible degree of detail includes over 30 points of articulation. The figure comes with interchangeable hands and Caps signature shield with straps.